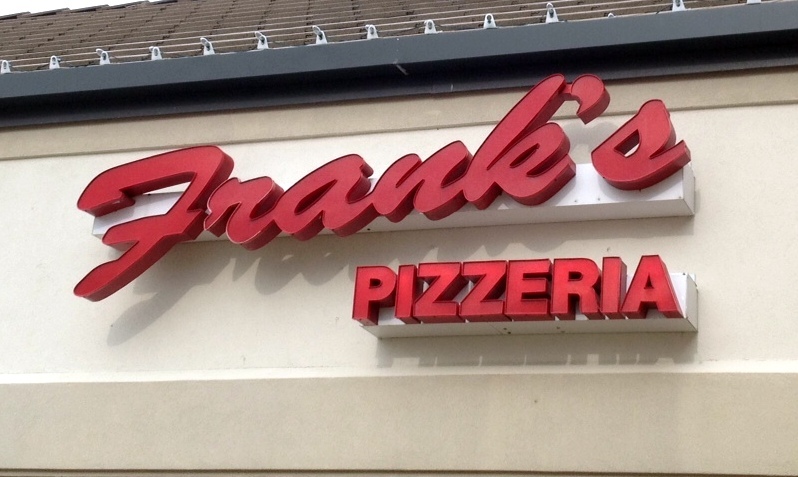 Frank’s Pizzeria sits in the busy Linden Market anchored by the Hy-Vee at 132nd and Dodge. According to Frank’s website, they’ve been in the area since 2003 serving true New York style pizza, and last Saturday night we popped over there for dinner. Frank’s is a decent sized place with around a dozen tables for seating. At Frank’s you order right at the front counter, which we did after quickly studying the large menu. We decided on an order of garlic cheese bread, a veggie pizza, a sausage and pepperoni pizza and a couple of sodas. Plastic silverware, napkins, etc. are located next to the soda fountain to your right. Our garlic cheese bread was out in a hurry. 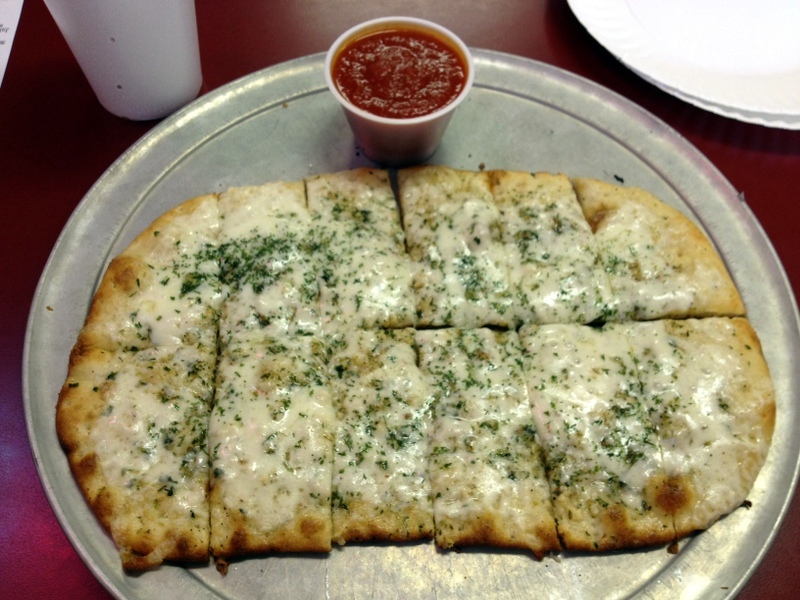 Frank’s has a little twist on their garlic cheese bread, that is to say it’s really not bread. It’s a pizza crust with a layer of minced garlic, some cheese and herbs on top. It was certainly different and we thought it was pretty good. The Pizza Wife commented after the first bite, “Oh wow. That’s good! But not as good as Bernie’s Pizza Parlor.” It’s served with a side of marinara for dippin’ and it’s as crunchy and flavorful as you would expect. After we polished off the garlic cheese crust (all of it- GONE), our pizzas arrived. First the veggie pie and then after an abnormally long delay, the sausage and pepperoni followed. As one might expect from a place claiming true New York style pizza, the crust here is hand stretched, thin and cooked in one of two Blodgett deck ovens. As a result, the crust is a bit charred and crispy and slightly chewy. The sauce here is a basic tomato sauce with few, if any, spices and was used sparingly. 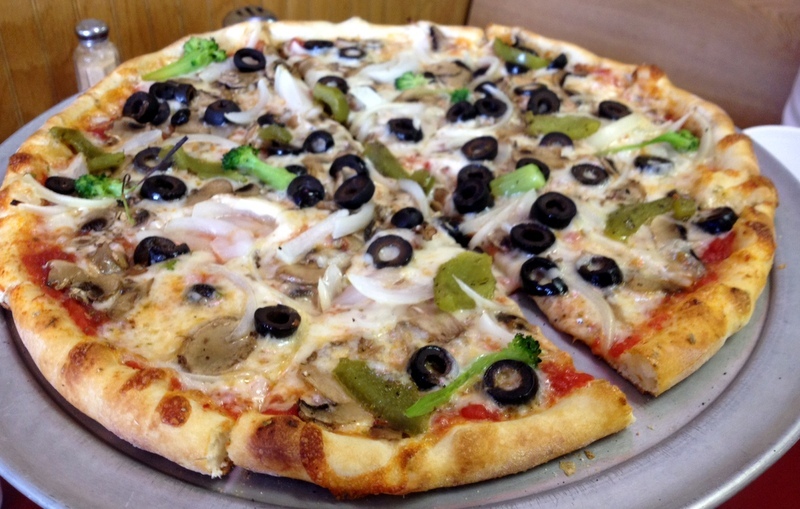 The veggie pizza had all fresh vegetables: mushrooms, onions, green peppers, black olives, and as an added surprise, broccoli. However, that “broccoli” consisted of five small stalks. And so many olives! What’s the deal with the overload of black olives on veggie pies? Is it because they’re so cheap? Yeesh. “More broccoli, please!” says The Pizza Wife. 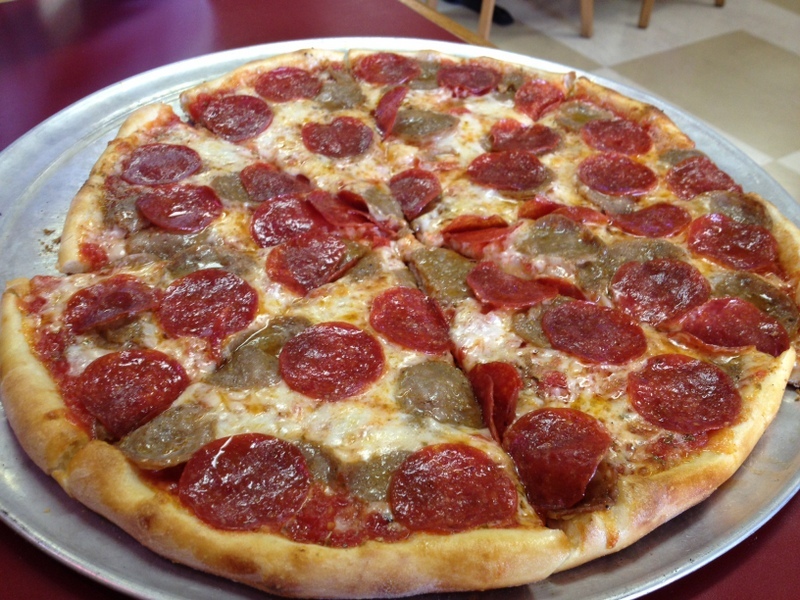 The sausage and pepperoni pizza was exactly as it should be – greasy and loaded with toppings. Frank’s uses slices of sausage, which is different than any other place we’ve visited to date. Unfortunately, they were less than tasty and certainly no where close to the quality of sausage that La Casa or Zio’s uses. 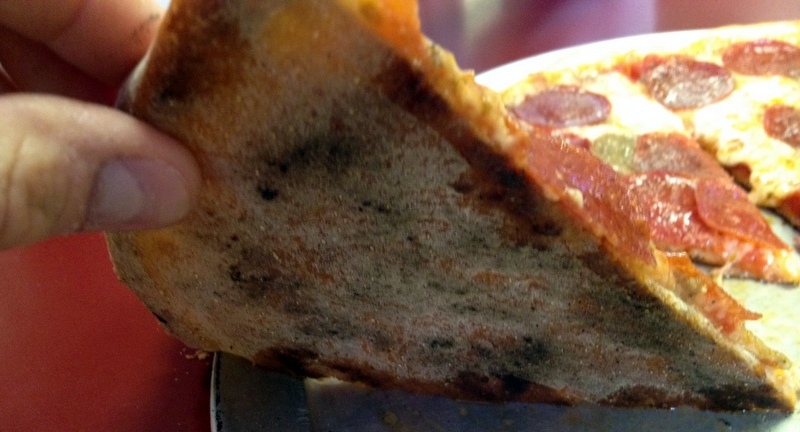 The pepperoni was good – as expected. All of the toppings were placed on top of a golden layer of melted cheese. Overall, Frank’s was just OK with us, Dog. 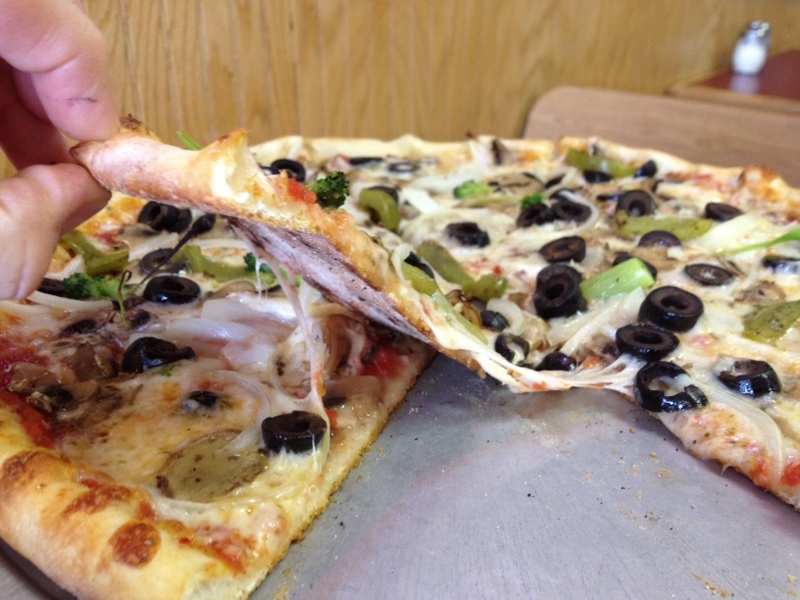 I’m a big New York style pizza kinda a guy, but I didn’t enjoy the crust or toppings near as much as I enjoyed Zio’s Pizzeria in March. The sausage was the biggest disappointment in my opinion. How would you rate Frank’s Pizzeria Pizza? Click on the stars below! This entry was posted in Pizza and tagged Frank's Pizzeria. Bookmark the permalink. This post makes me want some pizza! I’ve never had sausage at Frank’s or Zio’s. Just pepperoni. They are both different, so which one really is representative of NY pizza up to the diner. I much prefer Frank’s Pizzeria over Zio’s because it truly is New York style pizza. Born and raised in New York, I’ve made a pizza tour around Omaha and was pleased with Frank’s the most. It is consistent with the pizza I grew up with and is a treat to have in Omaha. If you want real new york style pizza, you’ll go to franks. Make this simple and get a pepperoni pizza, and some garlic knots. Case closed. Much better than Zios, the New Yorkers in my family agree. Wow! Zio’s is garbage. Frank’s blows them away. I lived in Philly and grew up in the Ponocos. Zio’s is horrible. Frank’s is the real deal. So excited to find Frank’s! We moved here three years ago after living for more than 20 years in New Jersey and NYC. This is truly authentic New York style pizza. We felt like we were back home. Zio’s is okay but it’s not Frank’s and it’s not New York. This will be the only place we go for pizza in Onaha. Loved the cheese pizza especially ? Funny. I ordered a meatball and pepperoni and the meatballs also came in slices. In fact, looked just like your sausage pic. Hmmm. I’m thinking they’re the same thing.